Fitted knit t-shirt with a peplum at the natural waist (also includes the option for a longer peplum in the back). 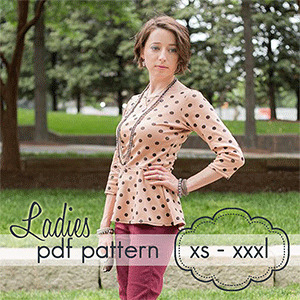 Patterns includes 6 sleeve length options: cap sleeves, short sleeves, elbow sleeves, 3/4 sleeves, wrist length and extra long. 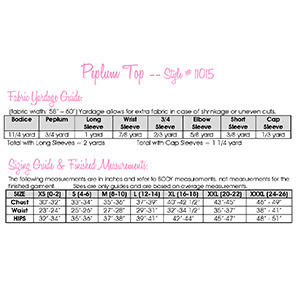 Recommended fabrics are stretch knits such as cotton lycra or lycra spandex.